Becoming a marriage counselor, degree in counseling and other education requirements, job outlook for marriage counseling jobs and annual salary.. 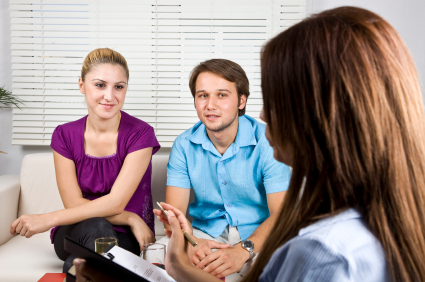 Marriage counselors are professionals who are trained in numerous counseling techniques. Counselors use these techniques to help couples find solutions to the problems that they may face in their married lives. Today’s world is quite fast paced and hectic. And difficult situations arrive almost in every couple’s life at some time or the other. Marriage counselors, therefore, help married couples in resolving a variety of conflicting issues and problems. These issues may vary from one couple to another. There are many more problematic situations that couples may face from time to time. Problems can vary from small to large. Married couples may face problems on a daily basis. In all these situations, marriage counselors make use of special techniques and counsel couples on modifying their behaviors and perceptions, depending on the requirement. Counseling may include multiple talking sessions which counselors use to identify the fears, issues and needs of married couples. Educational requirements to become a marriage counselor may vary from one state to another. A bachelor’s degree with a supporting counseling course may be acceptable in some of the states. However, a master’s degree in counseling is the standard requirement for becoming a successful marriage counselor. In addition to obtaining the required education, counselors also need to be licensed by the state where they work. According to the United States Bureau of Labor Statistics, the employment growth rate for marriage counseling jobs is expected to grow much faster than the average of all occupations. A growth of 30% is expected from 2006 through to the year 2016. Salaries earned by marriage counselors depend on the years of experience they carry. Those who have an experience of 1 year or less earn between the range of $29,938 and $46,452. Counselors who have an experience of 1 to 4 years earn an average annual salary ranging between $32,016 and $45,453.